Cabrini University is an inclusive Catholic, liberal-arts university dedicated to academic excellence, leadership development, and a commitment to social justice. 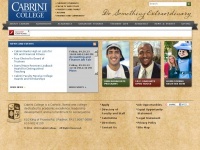 four profiles were found for Cabrini.edu in social networks. Among other social networks the website is represented in Facebook, Twitter, LinkedIn and YouTube. The web server used by Cabrini.edu is located near the city of Maitland, USA and is run by NetWolves Network Services LLC. The website Cabrini.edu has a own web server. The web server only runs this website. The websites of Cabrini.edu are hosted by a Microsoft-IIS server and were developed in the programming language ASP.NET. The HTML pages were created with the latest standard HTML 5. The website does not specify details about the inclusion of its content in search engines. For this reason the content will be included by search engines.